If you feel a tingling sensation, numbness, weakness or pain in your wrist or hand, then you might a victim of carpal tunnel syndrome. Carpel tunnel is becoming common these days which cause the median nerve to be pinched that goes from your palm to forearm. Don’t worry! We have a solution and that is a carpal tunnel brace. Your hand can become so numb and weak that it becomes difficult to even hold a pen or cup. A wrist brace can be a game changer if you suffer from the above symptoms. You must be wondering what a wrist brace is and how it helps. Overall, a wrist brace is specially designed to keep your wrist in a neutral straight position. It helps to alleviate the symptoms and pain of carpal tunnel. Wearing a carpal tunnel brace can also help in the healing process by rejuvenating the median nerves by increasing blood flow to the carpal tunnel area and creates optimum heat. There are many types and varieties of wrist brace available for the treatment and prevention of carpal tunnel. Before you choose the right brace for your hand, there are some things to know. As the name suggests, it is to be worn at night during sleep. 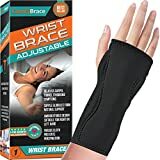 This is for people who suffer from wrist and hand pain especially at night time. This type of wrist brace is padded with little ventilation holes in it to keep you comfortable and cool during the sleep. It is made from a very light-weight material with a rigid removable splint (aluminum) that prevents median nerve inflammation and irritation. This is a multi-purpose standard brace that keeps the wrist in the right position. It is to be worn casually at home or during work if you experience wrist pain or swelling. It comes with an optional splint to provide to support and wrist flexion. The standard brace is made from neoprene material that is soft, safe and comfortable to wear for long periods. 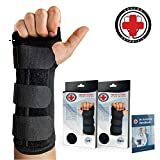 If you looking for extra support and stability of your wrist, then this type of brace is the one for you. It provides high-level stability and is effective for carpal tunnel syndrome and arthritis pain. It has 3 or more removable splints for extra added support. This is the most versatile type of wrist brace that you’ll see in the market. 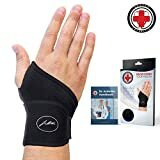 In addition, they are used for mild wrist pain, sprain and strain. Also, the fabric used is temperature-controlled which provides flexible support with a gentle compression that enhances the blood flow towards the wrist to help you recover fast. Comfort should not be compromised. Look for a carpal tunnel brace that is made from a breathable soft fabric and is comfortable to wear for more than 8 hours. The brace straps should also be of a perfect size, a misfit tight brace can constrict the blood flow worsening the pain. In addition, the straps or Velcro to tighten the brace should be adjustable. In fact, for proper and accurate stabilization of your wrist at a neutral position, make sure that the splint is rigid. Moreover, flexibility is another important factor to consider. So, the brace should be a little stretchy or flexible allowing you to use your hand. This black colored right-hand wrist brace by Mueller Green helps to recover and prevent wrist injuries. It comes in two small/medium that is 5 to 8 inches and large/XL (8 to 10 inches) sizes to fit your hand size accurately. Also, the easy to fit wrist brace provides proper wrist alignment preventing carpal tunnel brace and its symptoms. As a result, you won’t have to worry about chronic wrist pain and inflammation. The Green brace includes a breathable comfortable fabric that you can easily wear all day long. Furthermore, it includes additional features like contoured supportive rigid stay and a metal spoon to provide extra stability, comfort, and support. This brace will provide you with a custom fit with the help of adjustable straps. The loop and hook closure allows a controlled compression. The three-layered wrist brace is durable; the middle core layer is made from non-petroleum based materials and green lining from recycled PET bottles 67%. The wrist support by Wellgate is especially for women to get relief from sprains, strains and carpal tunnel syndrome symptoms. Furthermore, it is extremely light-weight and comfortable to wear. The wrist brace measure 7 x 5.2 x 3.7 inches. As a result, it fits almost all women wrist sizes. Moreover, the slim fit and sleek design hide and camouflage with the women clothing. PerfectFit includes a memory foam construction to provide extreme comfort. Thus, no more aching wrists! Overall, this right-hand brace is ideal for everyday use even for sleeping. All in all, you can ease the wrist pain with the best carpal tunnel brace. Not only that, but prevent future injuries, stabilize the weak wrist joint and recover from carpal tunnel syndrome. Do yourself a big favor by buying the right wrist brace for you because health is above everything.